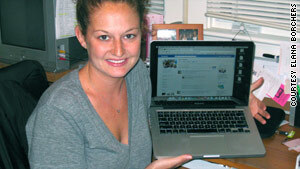 Some Facebook users, like Elana Borchers, are using aliases on the social-networking site while they hunt for jobs. What kind of information? "Inappropriate" comments by the candidate; "unsuitable" photos and videos; criticisms of previous employers, co-workers, or clients; and even inappropriate comments by friends and relatives, according to the survey report, titled "Online Reputation in a Connected World." Such prying into his online life makes Gawel uncomfortable. "I understand that when [employers look] at someone's Facebook page, they're just trying to paint a bigger picture of the people they're hiring -- so they're not just a name on a résumé," he said. "But that doesn't demonstrate whether they can do the job. It shouldn't matter what someone does when they're not in the office." Gawel said he's not sure that employers would object to the information on his Facebook page. For him, it's more about personal privacy. "Too many people take pictures of you. I didn't want to go through and 'untag' all of them," he said. "There's nothing illegal or too ridiculous in the photos ... but people don't take pictures of people studying or doing school work. They take pictures of people at parties and doing silly things." For better or worse, online screenings may be a permanent part of the 21st-century hiring process. The Microsoft survey found that 79 percent of U.S. hiring managers have used the Internet to better assess applicants. Dan Eggers of Partners Marketing Group in Marietta, Georgia, is among that 79 percent. "We review and certainly do research on anyone we're looking at hiring or using as a contract employee," Eggers said. "We would Google their name, look at LinkedIn, Facebook and Twitter." He said his firm usually only consults an applicant's online reputation to make sure he or she hasn't misrepresented their work experience. "We try not to pay a lot of attention to wall posts from others. It would take quite a bit for us to be reacting to that," Eggers said. But racist or homophobic comments will land your résumé and cover letter in the garbage, he said. "People have a false sense of security about their personal information out there on the Web ... they think only their friends will see it," said Jack Rayman, senior director of career services at Pennsylvania State University. Elana Borchers, an Indiana University senior, said she exchanged her last name for her middle name on Facebook in November when she started applying for jobs. Borchers even decided to keep her alias after landing a full-time position a month later. "Not everything is certain," she said. "If my employers saw something on my profile now that they didn't like, they could take my job away." Not that she's worried about the content on her Facebook page. "There's nothing bad [on my profile]. I'd rather they learn about me in person," Borchers said. "Big Ten schools have the reputation of excessive partying. That's something that's here with me in college, I don't plan to take that partying with me in the future and I didn't want someone to see that and judge me." Borchers said she thought about removing pictures of her partying, but "they're my memories and I want to keep them for now." Many of Borchers' friends are playing the Facebook name game, too -- dropping their last names or using a nickname to hide from potential employers and grad-school admissions officers. "A lot of my guy friends changed [their user names] to a nickname that their friends call them, so everyone still knows who it is," she said. Facebook spokesperson Kathleen Loughlin said she could not comment on the number of users who change their name on Facebook, but students who spoke to CNN said that among their peers, the trend is rampant. Another Indiana University senior, Jeffrey Lefcort, changed his Facebook user name to Jeffrey David -- his middle name -- when he began applying for jobs, even though he doesn't think his page has anything inappropriate. "I just didn't want to be found by someone who was looking for me that I'm not friends with," Lefcort said. "My Facebook profile is not intended for employers. I didn't want them looking at my personal life." Like Gawel, Lefcort eventually ditched his pseudonym and opted instead to tighten his Facebook privacy settings -- something Facebook's Loughlin said is encouraged. With the Internet playing such a large role in business today, few recruiters don't assess applicants' online reputations in some capacity before hiring, said George Matlock, director of operations at Matlock Advertising and Public Relations in Atlanta, Georgia. And while Matlock said he almost always Googles a person's name before hiring them, he steers clear of Facebook. "I haven't looked at [an applicant's] Facebook page," he said. "I try to stay away from it, myself. I think it's too personal ... maybe I'm just scared to see what's out there. Facebook tends to be something pretty private." Emily Mitnick, a Michigan State University senior who also changed her name on Facebook, said she has nothing to hide but wants to keep a low profile and avoid being searched by potential employers. Mitnick uses LinkedIn to communicate with the "professional world." She describes Facebook as a place "where I can be social with my friends and I don't have to be professional. "I don't have any of my [tagged pictures] available to the public -- just for precautionary measures, not because they're inappropriate," she added. "I would just like to remain somewhat private." Rayman, the Penn State career counselor, said he recommends that students with potentially incriminating photos or posts change their name on social networking sites. But it's not always that easy to escape your online reputation, he said. "Web sites are almost impossible to eliminate," Rayman said. "They get cached somewhere and they'll keep coming up. It used to be if you had a poor reputation in one school, you'd move to another and your record didn't necessarily follow you. It's getting harder and harder to do that as everyone is on the Internet and everyone knows everyone's business."